This is the new weather station in the Forage Production Plot- taken 3/7/18. Sierra Foothill REC has been collecting and recording rangeland forage production data since 1979. Every year when rangeland forage production values are recorded, explanations as to the results of pounds per acre grown are based on past forage production values & statistics, plus a CIMIS weather station which resides at 660' elevation; whereas, the Forage Plot lies at 1470' and 1.3 miles away from #084 Browns Valley CIMIS Station. 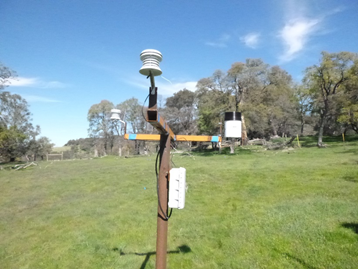 SFREC has recently installed replicated soil temperature sensors (5-10 cm in depth), soil water content sensors (5-10 cm, 25-35 cm, & 56-65 cm in depth), air temperature sensors, and a precipitation gauge. 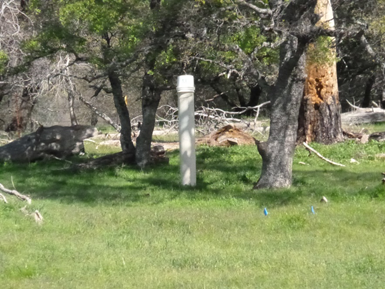 Two replicated soil sensor stations were each placed under canopy and in the open. Illustrated below are tables and graphs depicting rangeland forage production values and trends, newly installed soil sensor data (Open and Canopy), and a dramatic comparison (Forage Plot vs. CIMIS) in precipitation values. This is the HOBO micro station, it takes soil temperature and moisture readings, under open sky. There were two major developments during this rangeland forage production season (Nov 1, 2017 thru March 1, 2018). The first being that we had the highest level of forage production for the month of February (1637 lbs/ac) in our recorded history. The warm February we had may be a contributing factor to this. The other major development is the significant differences in monthly/total precipitation values between the CIMIS and the forage plot. If you have any comments, please leave your reply directly below. 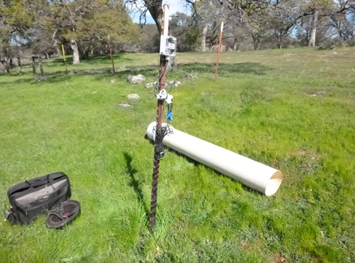 This is the HOBO micro station, it takes soil temperature and moisture readings, under tree canopy. Nikolai, when I fired up my computer this morning and found the SFREC NEWS Blog line in my Inbox, it felt like I had come home again. I spent time with the array of posts given, by Dustin Flavell, Nathan Van Schmidt, Helene Dalke,and Alexandra Stefanich (from the latter's post: I know well the road near the Yuba, where her picture shows some lucky students running about "in the wilds" at play). 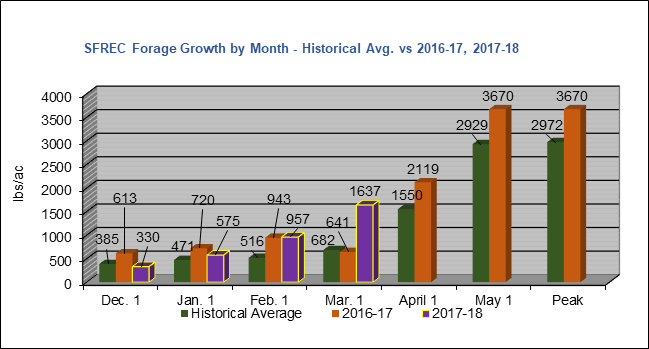 Add to that the annual SFREC updates on the furtive Black Rail and trends in forage production as modified by seasonal weather variations, and it demonstrates well why such facilities must exist, and deserve strong regional, institutional, state, and federal support. My associations with the "Sierra Field Station" (research, teaching, outreach, and some administration) began in 1965, when I was invited to join a small group of people, a precursor of Research Advisory Committees to follow, all melded to form a major part of my life. I gained much, and I have much to give back. Nikolai, let's set to work on that. Nice write up Nikolai. Very happy to see that we now have the ability to review both precip. and soil temperature data that has been generated at the plot and not have to rely on CIMIS which is all the way down at HQ. 680 lbs/ac growth from February 1 to March 1 is pretty phenomenal, but to have over 1,600 lbs/ac of total production at this point in the season is impressive. This must be a record amount of growth? Based on your soil temperature values being above 50*F or just slightly lower for a few months , I would suggest the forage really never stopped growing. April 1st reading should be real interesting if it stays warm and we get the amount of rain forecasters are predicting for March. I look forward to hearing the results. Great to have all of this information in one place (and site specific) - thanks, Nikolai! I am observing similar production in Placer County, although I wonder if our forage will mature earlier than normal, too! Will be very interesting to see what peak standing crop is this year.